Once the assembly elections are over next month, it’s almost certain that we’ll see another round of oil price hikes, but how large the hikes will be is really the question, and whether they’ll be enough to cover the yawning deficits of the public sector oil companies. The losses or under-recoveries rose from R9,274 crore in 2003-04 to a whopping R1,03,292 crore in 2008-09, fell to R46,051 crore in 2009-10 and rose to an estimated R78,000 crore for the year just gone by. l Just 1.3% of all rural households use kerosene for cooking. While the number of households using kerosene fell by a third between 1999 and 2005, the government cut PDS kerosene by just 13%. Parikh points out that since per capita incomes rose 60% since 2002 when kerosene prices were last raised, prices could have been raised by around R6 a litre instead of R3 without changing the level of welfare of consumers. 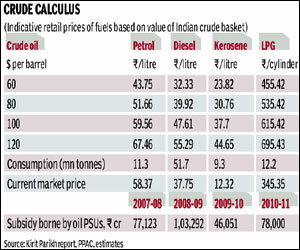 l In the case of LPG, he calculates a R200 hike in LPG cylinder prices would have left consumers unaffected. Obviously, there’s no question of hikes of this nature. Indeed, since petrol prices were freed in June last year, they should have risen to R67.46 per litre, but they’re just R58.37—this would suggest the state-owned oil PSUs are still fixing prices in consultation with the oil ministry. There are some suggestions that the CAG’s next report should investigate why this is happening! While most analysts talk of the losses the oil PSUs have to incur, what’s less appreciated is the loss the government incurs in its capital assets as a result of this. Taking an average price-earnings (P-E) ratio of 10 for the oil PSUs (it’s 9.9 for IOC, 10.1 for ONGC, 16.1 for GAIL, 10.7 for HPCL and 14.1 for BPCL), a R78,000 crore under-recovery in 2010-11 means a loss of R7,80,000 crore in terms of the market cap of the oil PSUs. Since the government owns around 70% of these oil PSUs, this means the government lost R5,50,000 crore of value in 2010-11. This figure could be even higher since oil PSUs have a lower P-E multiple than private sector firms—the latter don’t have to lose money on subsidising customers and so the market looks at them more favourably. IOC’s profits this year are likely to be around R5,000 crore. Given its share of under-recoveries, its adjusted 2010-11 post-tax profits will probably be R25,000-26,000 crore were there no under-recoveries—based on its P-E of 9.9, its market cap would have been R2,50,000 crore instead of the current R81,000 crore! Multiply IOC’s likely adjusted profits with RIL’s P-E and the market cap you get is even more stunning. Since 2003-04 to 2010-11, total under-recoveries were R4,23,000 crore—this means the government lost more in value last year than the oil PSUs spent in the last 8 years on subsidies! In other words, had the government given oil PSUs a direct grant from the budget for each year’s under-recovery, the oil PSUs’ profits would have risen, as would have the value of the government shareholding in these assets. And, yes, since the private shareholding in these PSUs is on average 30%, private shareholders wouldn’t have suffered any loss in their wealth either. It’s not as if the government doesn’t give such direct payments to keep prices low. Today, whenever state governments ask the state electricity boards to supply below-cost power to farmers and other groups, the losses incurred are made good from the state government budgets. There is another important issue to keep in mind. With the economy growing at 8-9% in real terms, and 15% or so in nominal terms, oil companies will have to invest several tens of billions of dollars to create the infrastructure to keep up with rising demand, both in terms of refinery and port capacity and in terms of marketing capacity. IOC’s ongoing capex projects for the next three years, for instance, require around R12,000 crore per annum—with its profits so low, IOC’s borrowings have skyrocketed from R19,000 crore two years ago to R55,000 crore today. While private sector firms like Reliance had begun to invest when prices were first decontrolled when the NDA was in power, they gradually withdrew as they couldn’t compete with the PSUs who burnt up R4,23,000 crore over 8 years. Which means we won’t have enough capacity created over the next 5-10 years since there’s just so much the PSU oil firms can borrow. Put it any way you like, and the PSU oil subsidies are a clear case of cutting one’s nose to spite one’s face.